This weekend I went up to Great Wolf Lodge with my Brother and his kids. Very fun place! The cost of a room is around $160-$250 depending on how early you book and how many people you have with you. They offer 20% Military Discounts at all of their locations. You can book online by clicking here or using the promo code "HEROES" or you can ask for the military discount at the front desk. All rooms come with FREE water park passes for everyone. There are also a lot of other fun activities. My brothers kids spend most of there time doing magic quest adventures that they have at the locations. 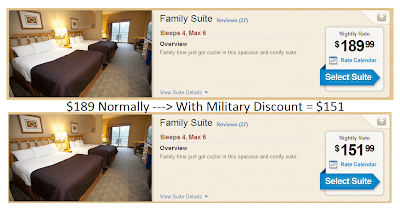 this was a great place to stay with the military discount!!!!!!!!!!!!!!!!!!!!!!!!!!! !